FLIR Systems Australia announces a new range of thermal imaging cameras for industrial R&D applications. Equipped with a cooled detector, the FLIR A35x0sc/A65x0sc series thermal imaging cameras are ideal tools for industrial R&D applications that need better image quality, more sensitivity and a higher frame rate than what can be obtained from a thermal imaging camera with an uncooled detector. 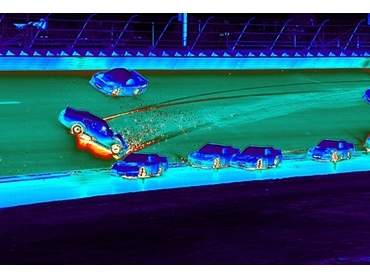 The FLIR X8000 or X6000 series can be used for higher frame rates and better image quality. The Mid-Wave infrared cooled detectors in the FLIR A35x0sc/A65x0sc-Series cameras allow the user to see through or at materials such as certain types of glasses or plastics, which is not possible with the uncooled Long-Wave cameras. The FLIR A65x0sc produces crisp thermal images of 640x512 pixels. Users that do not need this high image quality for their application can choose the FLIR A3520sc that produces thermal images of 320x256 pixels. A high thermal sensitivity of <25 mK, which captures fine image details and temperature difference information, is a common feature across all versions. External triggering allows synchronisation of the image to capture fleeting events. One camera can be configured as master and others as slave for applications requiring more than one camera. FLIR A35x0sc/A65x0sc-series thermal imaging cameras work on a snapshot mode with all pixels registering the thermal event simultaneously. Image blurring is avoided while capturing moving objects or in motion applications. A new camera interface standard developed using the Gigabit Ethernet communication protocol, GigE Vision allows for fast image transfer using low cost standard cables even over long distances. With GigE Vision, hardware and software from different vendors can interoperate seamlessly over GigE connections. FLIR A35x0sc/ A65x0sc thermal imaging cameras work seamlessly together with FLIR ResearchIR/ ResearchIR Max software, which allows for viewing, recording and advanced processing of the infrared data provided by the camera. Each camera comes standard with a basic version of FLIR ResearchIR software.